Since Shania Twain splashed belly-button first onto the country music scene with a record-breaking album in 1995, fans and media alike have marveled at her supermodel looks, her silver-screen sexiness and now her spectacle of a tour. But for Shania, the glamour is just the sizzle -- and her music is the meat of the matter. "This is the way I treat everything I do in my career. The music leads the way and dictates everything," she declares. The music has always come first for Shania, who started singing professionally even before she was old enough to enter the clubs where she performed. "I started singing so young that the only way I was allowed in those clubs was for the band and the club owner to agree to bring me up onstage," says the 33-year-old. "That's why I now have a guest singer come up onstage during my show every night. I like to give these kids a chance to get up and sing." Shania's music is the driving force behind her phenomenal stardom. In 1995 she released her landmark second album, The Woman in Me, which spawned seven hit singles and sold a phenomenal 10 million copies -- the best-selling country album by a female in history. Her latest album, Come on Over, has sold 5 million copies since its release last November, and is on pace to top its predecessor. 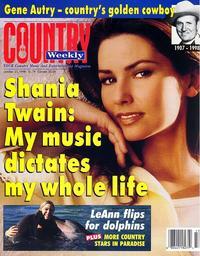 To those who consider her sound too pop for true country, Shania points out that her millions of fans can't be wrong. "I find that the very thing I'm criticized for, being different and doing my own thing and being original, is the very thing that's making me successful," she reasons. Besides, she says, her music is deeply rooted in country. She uses her recent hit, "Honey, I'm Home," as an example.
" 'Honey, I'm Home' is not really an ambitious song for country at all, actually," Shania says. "I find that it's quite traditional in a lot of aspects. It just happens to be updated for the '90s. "Take for example the song 'Take This Job and Shove It.' You heard a lot of music like that when I was growing up. It was much more frank, in-your-face and real. That's what I'm trying to do with my music. "What I tried to do with 'Honey, I'm Home' and a lot of songs on this album is to bring a sense of humor to real-life situations that might otherwise be problematic. Role reversal is what 'Honey, I'm Home' is all about -- it's basically a satire. Of course, it's a huge exaggeration of what it's really like, and what women would imagine it could be in our wildest dreams. "It's just my attempt to bring a sense of humor to the changing times and th challenges we have with the sexes in general in the '90s. "My goal is to appeal to as many people as I can," she adds. "The more people who hear your music, the more satisfied you are as an artist." While her tour features more pyrotechnics than a World War II flick, the special effects give way to the music at all the right times. "We're offering the best in lighting and sound, but the music will always be first," she says. "It's funny, but my performance style and communication hasn't changed since I was a teenager. I started singing without my guitar and moving around the stage and interacting with the fans in clubs. "I was always a communicative performer, so I've just taken that on to a bigger stage." Shania's even pulling up roots for the sake of her music. She and her husband/producer Mutt Lange are moving their home and recording studio to Switzerland so they can write and record in peace. "It was a decision we made for the sake of the studio," Shania says. "It all boils down to where we want to spend the rest of our lives making music. It's kind of hard to record when you have everyone wanting to know what you're doing all the time. That's the problem with our home in New York. We need privacy not so much on a personal level, but for the music. "I also have a home in Florida where I stay when I'm off, so we're not leaving the States completely. But we're moving the studio. We're going to go somewhere in Switzerland, not very far from Montreaux, where they have a lot of music stuff going on. The studio's going to fit in there as opposed to standing out. I think that's important."